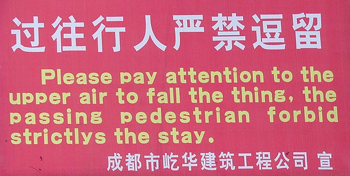 They say “make hay while the sun shines” in the western world and goodness knows how that would be translated by the ‘brilliant’ Chinese minds that brought you the amazingly inept translation below, but who cares really, not me. And that is because as I explained yesterday my Chinese gagging order has probably been relaxed as the leaders of the next superpower fight between themselves for ever larger control of the government of China and of course a bigger bucketfuls of all of the money sloshing around in the corridors of power there. All of which makes your average multi-billionaire Russian Oligarch look like a toddler with a large suitcase or two of play money. 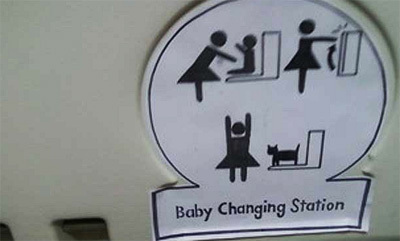 This sign and its wonderful translation, I have to say, is the ‘best’ translation I have ever not been able to read let alone comprehend and I assure you that if you wanted to write this kind of mental drool you couldn’t string enough words together to produce perfect drivel to do it. Well done China the next superpower. I have just tried to ‘translate’ the saying at the beginning of this blog using the Chinese method of translation and wondered what you thought of it dear cuddly readers. “Hay shines while make sun.” No, I just don’t have their ‘gift’ do I? 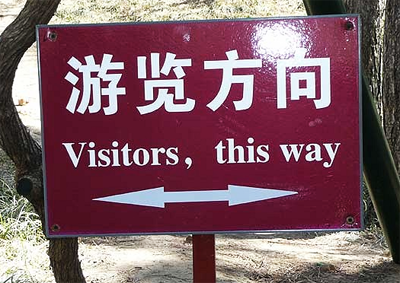 I think that this sign displays just what China thinks about visitors don’t you? 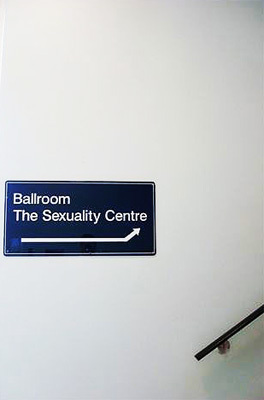 A Sign of Mmh What? Ok so today is the second sunny day and we are about four or five days into snow free weather, which will probably give you some idea about the temperature, with or without the sunshine it is cold. But after two days of (not consecutive) sunshine the good people of Prague have decided that it is short and shirt sleeve wearing weather and are out and about in their hundreds – Prague is a small place and as yet the population hasn’t doubled in size with tourists – proudly showing their knees. Are the Czechs mad? Well no not really they are healthy and think that their knees should be on display as often as possible, thank goodness they only think that their knees should be on display as often as possible, if you see what I mean! But honestly having so many knees on display is a little off putting for a Cat; human knees, like all knees, are not nice, no wonder Cats hide theirs under fur, but then Cats are nice discrete animals aren’t they! And it is for that reason, modesty in the knee department that Cats are not like Pavels (the name I have given all Czech males – Pavelinas are the female equivalent), we would be mortified if we had our knees on display even on the hottest day. Why? Do I hear you ask, well it is simple really, shorts are just about alright on young people, but when a middle aged man wears them to work and carries a briefcase and has a tie on you start to wonder don’t you? I do! 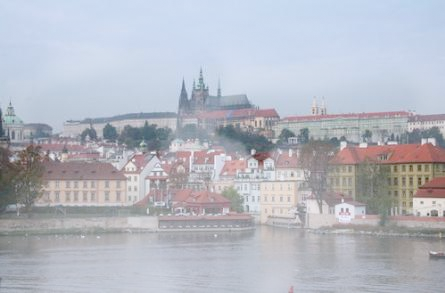 Still there are lots of reasons why Prague is a nice place to live, the steam coming off the river this morning made the place look magical especially if you happened to be standing on the famous medieval Charles Bridge and looking up at Prague Castle, in fact I wish I had been!